You know those days weeks when you say to yourself “what? they want to be fed AGAIN”? Yeah, so this is one of those weeks. Lots of comings and goings, not alot of time. So, I did what I will often TRY to do in this situation. I spent my morning preparing a bunch of ready-to-go meal-type options. We usually try and eat a family dinner together during the weekdays, but occasionally, we have weeks like this one, where that will be virtually impossible. I tried to get some stuff in the fridge that you can just add to a salad, and voila, have a relatively healthy meal. 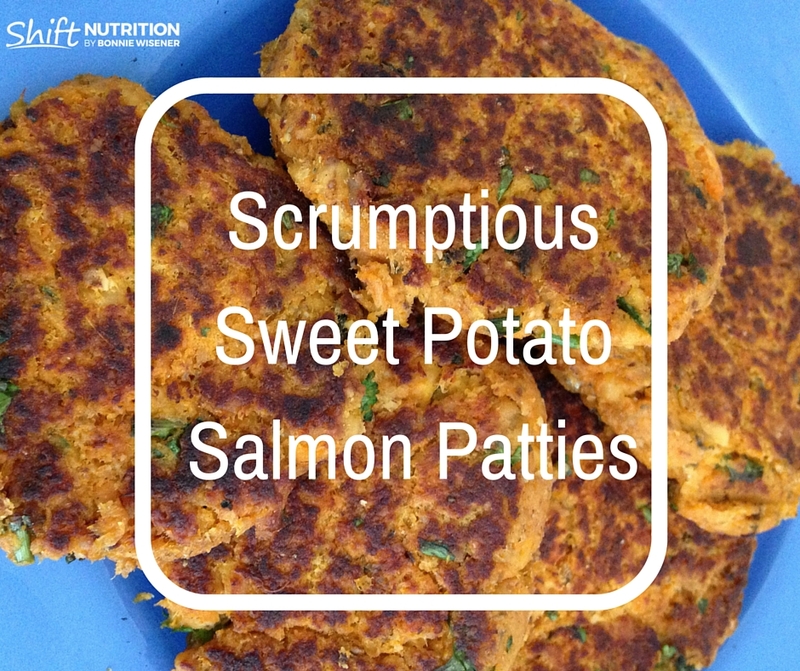 For example, grilled chicken breasts, chopped egg salad, tuna, and this very yummy concoction “Sweet Potato Salmon Patties” that I just kinda pulled together to see how it tasted. Let me tell you – it tastes great!! Peel and cook sweet potato until softened. Let cool. In a large bowl, mash sweet potato with a fork or potato masher. Add egg, onion, lemon juice, almond meal and seasonings. Blend well with a fork. Add can of salmon, mash it up and blend it all together. Taking about 1/3 cup at a time, form into patties. Add grapeseed oil to pan, let it warm up. 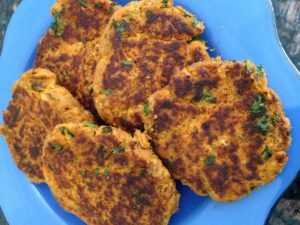 Place patties onto oil and warm at medium heat for 5-6 minutes per side. Eat hot off the pan, or place patties in container in the fridge for up to 5 days. NOTE: Double ingredients to double the batch. These will freeze well. 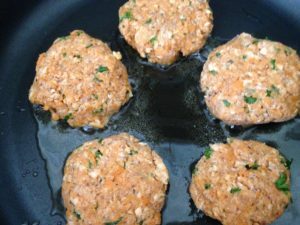 Serving ideas: * serve over green salad *serve with a burger bun, add favourite garnishes * break up and serve in a wrap with veggies and hummos.